It often happens that when you shoot a video with your mobile phone and then transfer it to your PC, only to find that your movie now is upsidedown or in the wrong direction. The good news is that you can rotate your video easily with some useful web-based video rotator tools. In order to help you save time and efforts, here we find 6 best online video rotators in the market that are capable of rotating or flipping videos with a few clicks only. The online video rotator can help you rotate the video in a few seconds. With Rotate My Video, you can easily rotate video in the clockwise direction or counter-clockwise direction. You are also permitted to change the aspect ratio of video file like 4:3 or 16:9. Once you adjust the ratio, this tool will smartly allow you to change the band color to make it fit. One great part of the rotator is that it always offers you a preview window, so that you can watch the rotated effect visually when you make any change. And you uploaded videos will be deleted automatically from the server after a few hours to protect your privacy. As its name implies, this is a powerful animated GIF maker, but we can also use it to rotate or filp video online. You can select your target video from your local folder or just paste the video's URL to the search box. With the tool, you can rotate a video 90 degrees, 180 degrees, 270 degrees or flip the video vertically and horizontally. This online video rotator supports many different video formats including MP4, MPEG, AVI, WebM, FLV, MOV, 3GP and more, but the maximum size of the video file cannot exceed 120MB. In addition, you're allowed to change the output format and encoding, which means export the video in original quality or in MP4 (H264/AAC) formats. After a few seconds, you can download your rotated video to your computer and start to enjoy it. All the information about the file such as file size, width, height and length, as well as file type will be shown at the button of video. Aconvert is a comprehensive online video tool, and of course rotating a video with it is also very easily. Similarly, you can upload your target video file from local folder or just paste the URL. One strong point of this online video rotator is that it provides many options for you to flip or rotate your video in accordance with your requirements. Aconvert supports a wide range of video formats including MP4, AVI, MPG, MKV, WMV, FLV, ASF, MOV, M4V, M2TS, WEBM, RM, VOB or OGV. And the maximum size of the video file can be up to 200MB. After adjusting your video, you can save it on the computer or to the online storage service like Google Drive and Dropbox. Remember to download it; otherwise, the output file will be automatically deleted on the server after one hour for security. 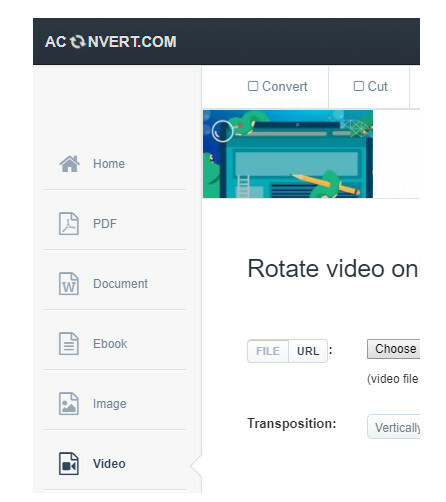 Rotate Video is a free video rotator that enables users to flip or rotate videos online in a couple of clicks. You can upload a video file from the computer or just enter a URL of the video. With it, you can rotate the video by 90 degree clockwise or counterclockwise, flip 180 degree as well. You can also set the encoding such as Universal, Normal or High, with description for each item. 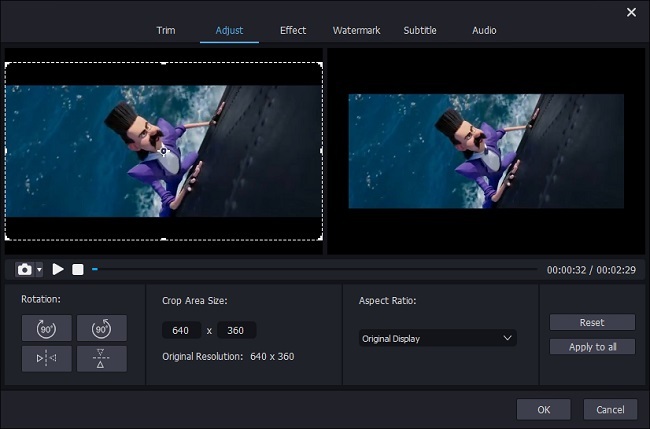 The tool supports plenty of video file types like MP4, MPG, MPEG, AVI, MKV, M4V, FLV, MOV, M2V, 3GP, WMV and you can also save your rotated video in MP4, M4K or MKV. 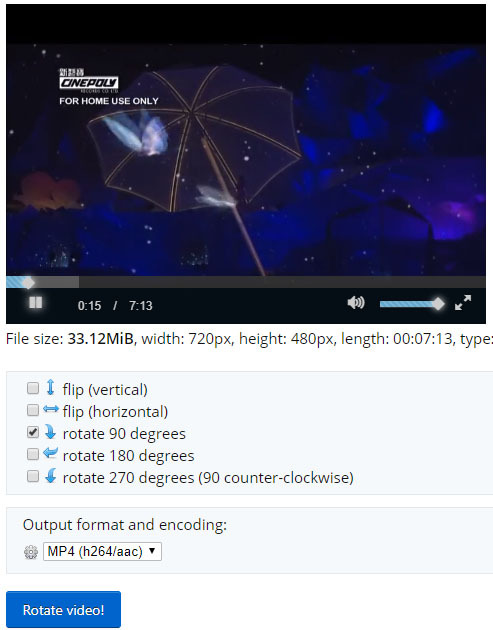 But the maximum file size for uploads is only 16MB, so if you have a small size of video needed to be rotated and adjusted, rotatevideo.org would be a perfect choice. This is a simple and enjoyable free video rotator online tool. You can upload your video from your computer's hard drive disk, or just drag and drop your local file to the center of the window. Alternatively, you're also allowed to import your movie from Dropbox, Google Drive and One Drive. After uploading the target video in a while, you can now rotate it left, right, flip it horizontally or vertically according to your needs. If you have done something wrong, just click the "Reset" button to redo it again. Besides, the site also offers more relevant online video tools for users to crop, stabilize and slice video. It is a straightforward web-base tool to help you rotate video with 3 steps only. Just select a file from the computer, choose rotation setting and then start to convert it. The online rotator supports several most popular video files like MP4, AVI, FLV and MKV. And you can rotate the video file 90 degree clockwise or counterclockwise, or flip the video 180 degree. After a few minutes, your rotated video will be saved on your computer that can be downloaded for watching. If you're not happy with these online video rotators and want to pick a desktop program to rotate or flip videos quickly in high quality, I will highly recommend a smart professional video rotator and flipper - Joyoshare Media Cutter. Joyoshare Video Rotator can assist you to rotate any video with high quality at a quite fast speed. You can rotate your movie by 90 degree left or right, flip it horizontally or vertically in just one click. The program supports a ton of input and output video file formats including MP4, M4V, AVI, MPG, MPEG, MOV, FLV, MKV, 3GP, 3G2, WMV, ASF, RM, RMVB, DAT and many more. You can also save your rotated video on various portable devices like iPhone X, Galaxy S8, Xbox, Samsung TV, etc.